In my head it’s always summer and I am constantly living the beach state of mind. Remember this? Well, it’s now happening. As you read this, I am off to a foreign land for a week. And the fact that I will turn a year older in a place that’s completely new to me makes it only more magical. 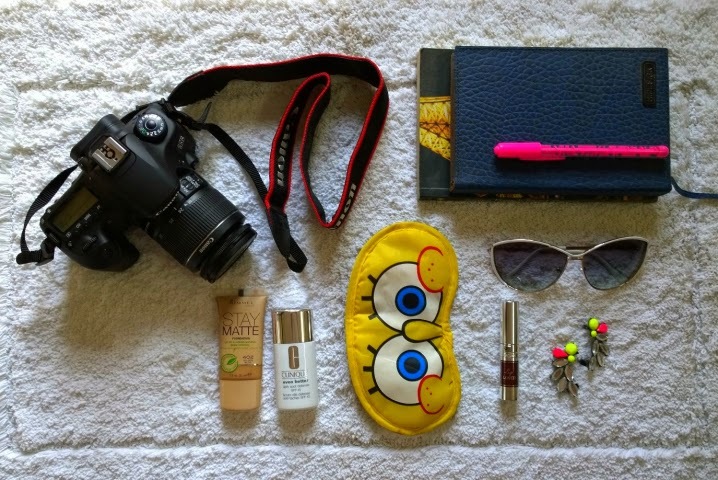 I thought I’d do a quick post featuring some of my favourite summer essentials that I’ve packed along for the holiday. The Lakme Eyeconic has been my everyday go-to since I started using it a couple of months ago and now I am on my third refill already. Team that with Revlon Color Stay Liquid Eye Pen for the flicked liner and I am good to go. I am a lip balm junkie. Having tried almost all varieties available at a store, it’s safe to say that the Neutrogena lip balm is the best no-nonsense lip balm that actually works! The Clinique Chubby Stick has been a favourite since its launch now and the Victoria’s Secret body mists seems like the best bet for any holiday in my opinion. It’s only been a while since I started using the Za True White Day Protector and I am hooked. It’s light, easy on the skin and has SPF 26+ PA +++ which easily makes it a must have in any summer beauty essentials kit. Also, the new L’Oreal Caresse range of lipsticks and glosses make for a light and easy summer lip colour and the Rimmel Stay Matte is the best compact set powder I’ve used yet. Anyone who knows me knows that I am a big Bath and Body Works, Victoria’s Secret and Boots hoarder. Their products accompany me on every holiday. Add to this list a pair of headphones, bikinis and tankinis (currently obsessed with the Roxy tropical print swimsuit above! ), vintage sunglasses, a bit of bling to spruce up the basics, a trusted camera to capture the visual wonders, a diary to pen thoughts, a good book to while the time away and I am ready for a long summer fiesta. A (special) travel diary and tons of outfit posts will be lined up for the weeks ahead. Also, you can follow me on Instagram as I will be updating it on a daily basis with the holiday pictures. I love reading and thinking about everything beach-y and summer-y but it really is my least favourite season. Given the layering freak I’m,I can never have enough of winter! And your instagram pictures have already been making me crazy! Add Smirthi’s Kerala pictures to your waterfalls and you’d know why I’m crying in bed every night. P.S.HAPPY B’day in advance! Much love!